I’m sure you can easily guess what I wished for. When I blew out that candle one year ago, I wished that I could become pregnant with a healthy baby. Never since my childhood days had I wished so hard for anything. I was eating at one of my favorite restaurants downtown with my husband and my mom. The waitstaff came out singing, and, much to my chagrin, the air conditioner blew out the candle before I got to make a wish. When they finished singing, they began to walk away. I motioned the waiter back over to our table. I asked him to relight the candle so I could make a wish. Matt asked if I was kidding, my mom shook her head and the waiter looked at me like I was crazy. He happily obliged, though. You see in past years I wouldn’t have thought twice about asking anyone to relight a candle. Not in my adult years at least. I usually didn’t put too much stock in wishes and absentmindedly wished for something general like good health for my family. Last December, however, we were in the middle of the infertility roller coaster and things were looking bleak. I was back on birth control recovering from Ovarian Hyperstimulation Syndrome with an estrogen level I probably should have been hospitalized for, a multitude of giant cysts covering my ovaries and a uterine lining that was just about destroyed. It was the month my doctor all but washed her hands of me, told me she thought my chances of conceiving a baby were slim to none and didn’t offer any solutions. I was broken and devastated. I cried hysterically, I got mad, I questioned God and I moped around. Each new pregnancy announcement felt like a knife in my heart. I let myself feel a full range of emotions. Then I realized that even when I thought I was losing my sanity, there was one thing I never lost: hope. I made a conscious decision to have hope. Being a mom had always been my heart’s desire, and I wasn’t going to let anyone shatter that dream for me. I had already experienced a lot of difficulty and numerous roadblocks. I knew there would be many more in my future, but that wasn’t any reason to give up. I had to change courses and I had to have hope. When you’re coasting through the good times in your life, you don’t put too much stock into things like wishing on birthday candles and praying with prayer relics. When you’re in the trenches, though, those things become so important to you. They’re signs of hope, and hope is all you have. So even though the air conditioner had blown out my candle (and my doctor had dashed my dreams), I didn’t give up. I got the waiter to relight that damn candle, I wished with all of my might, I changed courses, I got a new doctor and I made a new plan. The road still wasn’t easy. We had a lot of setbacks and felt a lot of pain along the way, but my wish came true. One year later, my beautiful little angel is growing inside of me. I’m sharing this story for all of you who are still in the trenches. Maybe you’re wishing for a baby this year or maybe you’re wishing for your dream job or maybe you’re wishing for something else altogether. Maybe today is the lowest point along your journey, just like my December of 2014. Maybe everyone is telling you that your dream is impossible and it can’t be accomplished. You might even be starting to believe them. Scream. Cry. Get pissed. You deserve to feel all of those things. But DON’T lose hope. I don’t care if one person or one million people have told you no, it’s impossible, it can’t be done, you are out of options, quit trying. I’m telling you: find another way. Light that candle, make a wish and choose to have hope. Eliminate the people from your life who don’t believe in you and aren’t helping you move forward towards that goal. Find another doctor, find another boss, find another avenue to pursue your heart’s desire. The only person who can ever truly stop you is yourself. I’m not saying it will be easy. I’m not even saying your end result will be the exact end result you imagined or the path will unfold the way you once planned. God might have an even better plan in store for you than the one you have for yourself. What I am saying is that God won’t put a desire in your heart without helping you fulfill it in some way, shape or form. If the things you’ve tried in the past haven’t worked, try something else. There are many different ways to arrive at the same destination. Most importantly: always choose hope. Miracles happen every day. I Made it to the Third Trimester! Well friends, I know it’s been a while, but I’m writing to let you know that I’ve officially made it to the third trimester! You may remember that I had a tear in my placenta at 13 weeks and bled profusely for 8 weeks straight. I was told I had a 50/50 chance. I would either miscarry the baby or the placenta would heal completely with no further complications. As you know, the placenta healed with full bed rest, and I haven’t had any complications since. All the glory goes to God on that one. The truth of the matter is, though, that while I tried to remain upbeat and positive throughout that entire ordeal, it was what can only be described as the darkest time of my life. Every day I had to count how many pads I soaked through to know if my baby was OK. I truly wouldn’t wish that on my worst enemy. My heart goes out to every woman who has ever lost a baby. You are stronger than I could ever hope to be. The reason I bring up that period of darkness is because at that point in the pregnancy, there was nothing the doctors could do to help me. The baby was simply not far enough along to make it on her own outside of the womb. For those long, dark 8 weeks the doctors kept telling me, “You just have to get to 28 weeks. You have to try to make it to 28 weeks. If we can keep this baby in until 28 weeks she can be delivered safely with an incredibly high survival rate.” I was 13 weeks pregnant at the time. 28 weeks seemed so far away. Unreachable. Unattainable. 15 weeks away. An eternity. 28 was the magic number, though, and I prayed to God every single minute of every single day that He would get me there. I didn’t ask for anything else. I had never prayed so hard for something in my entire life. I thanked God for every new week of pregnancy I reached. Each week was an important milestone on the journey to that ultimate goal. What a moment! I went to mass and fell on my knees with tears in my eyes. I’m here. I’ve officially made it to 28 weeks and the third trimester. Fortunately, we are in such a great place now and there are no longer any plans to deliver her any time soon. We fully expect her to make it to full term. But still, this was such an important milestone for me. There were so many days I didn’t think I’d get here. I have no one to thank but God for getting me this far. I also have to give some credit to this little fighter growing inside of me. I am so incredibly in awe of this baby girl. They were worried she wouldn’t make it. They were worried she was getting limited nutrients due to the tear in the placenta. Here we are at 29 weeks and they say she’s in the 97th percentile and measures 3 weeks ahead of schedule. God had bigger and better plans for her, and she worked hard to prove everyone wrong. With this in mind, I have been doing everything I can to enjoy the pregnancy and embrace the fun moments ever since I got off of bed rest a few months ago. I think we’ve done a good job of that. Here are just a few of my favorite times along the way. Baby’s First Halloween: We put these costumes together at the last minute. Matt decided he wanted to be the Cat in the Hat and when I saw the Thing 1 costume I instantly had the idea to make Lucy Thing 2. With a little hot glue, I was ready to go in no time. It was a fun way to incorporate our sweet girl into the festivities. My baby shower: My aunts, my cousins, my godmother and Lucy’s godmother got together to throw us an absolutely beautiful shower. There was a torrential downpour that day with tornado warnings, but so many family members and friends braved the weather to come out and shower us with love. It was kind of the perfect analogy for the pregnancy: celebrating in the rain instead of waiting for the storm to pass. It was one of my favorite days in recent memory. It meant everything that our loved ones put so much time and effort into making the day perfect for us. They were so generous, and we got just about everything we needed for the baby. The most special gift I received that day was a teddy bear made out of one of my dad’s old shirts. I don’t think I’ve mentioned this previously on the blog, but my dad passed away 5 years ago. It breaks my heart that he won’t be there the day my baby is born and he won’t be around to watch her grow up. I truly believe, though, that he held her in Heaven and had a hand in sending her down to us. When I was struggling through infertility, a family friend was kneeling in front of the Blessed Mother and had a vision of my dad holding 2 babies. They were my babies and he said he wanted to spend some time with them in Heaven but when he was ready he would send them down to me. I’m not sure where the second baby fits into the story. It might be a child I’m going to have in the future. However, a few months later I finally got pregnant and found out the baby was due on my Dad’s birthday. We tried for so long to have a baby. Of the 365 days in a year, our little girl just happens to be due on my dad’s birthday. You may think it’s just a coincidence. Maybe it is. I choose to believe that’s another God moment, though. Anyway, I will always treasure this bear. It eases the pain to know that Lucy will be able to snuggle with a little piece of her grandfather. Thank you, Darlene, for this beautiful tribute. Working on the nursery: For years I have daydreamed about what I would want our baby’s nursery to look like. If it was a boy I wanted to go with a nautical theme, because Matt works on ships and loves to fish and be on the water. If it was a girl I wanted something sweet and delicate. I always told Matt that I wanted to get a chandelier for the nursery if we had a little girl. He said that was ridiculous and there was no way he would go for it. One day shortly after I got off of bed rest, he looked over at me and asked if I wanted to go pick out a chandelier for the nursery. I’m sure it won’t be the last time he changes his tune for his little girl. We had a lot of work ahead of us before we could start her nursery because we had to renovate our entire upstairs. We bought our house 3 years ago and left the upstairs alone to save money. Once we found out we were expecting, we started slowly working on projects up there. I’m so happy and relieved to say that the renovations are finished and baby girl’s nursery is complete. It came out better than I could have ever imagined. Sometimes I go in there, rock in the glider and just look around imagining how much love and joy is going to fill that room soon. One of my favorite parts of her nursery is this Shakespeare quote on the wall. After all of the things she has overcome in utero, I think it captures her essence perfectly. It’s hard to believe that there are only about 10 weeks left until we get to meet this child who is the answer to our prayers. Her birthday will be here before we know it. I want the time to pass quicker because I just can’t wait to meet her, but I’m trying to also remember to enjoy the journey and soak it all in. To all of you who are struggling and going through dark times right now, just know that you won’t be in that valley forever. Although the road seems so long and it seems like you’ll never get to that bright light at the end of the tunnel, I promise you will. Keep pushing. Keep praying. I can’t tell you that one day you’ll be the same person you were before it all began. You will be so much stronger than that. You will come out with a renewed sense of faith that God will never bring you to something without bringing you through it. You’ll come out with a new sense of self, and you’ll come out with an even greater respect and appreciation for the happy times. The light always shines the brightest just after the darkness gives way. I have lots to update y’all on today! After a week on bed rest, we followed up with my OBGYN Monday. I had been blood free Thursday, Friday and Saturday of the previous week. Sunday and Monday I started with some spotting again. I wasn’t overly concerned because it was brown, which means it was old blood. An ultrasound showed the same area of discoloration on my uterus. The doctor told me last week that he believed the spot was just a uterine contraction. The fact that the same spot was still there a week later confirmed that it was NOT a uterine contraction. It was most likely a bleed, just like the hospital had initially diagnosed. My doctor advised me to go home and stay on strict bed rest until I was blood free for at least a week. He believed the problem would resolve on its own. Matt and I decided to follow up with a Maternal Fetal Medicine specialist for a second opinion. We were lucky enough to get an appointment with the MFM specialist that Wednesday thanks to two close friends (Thanks Brittanie and Mrs. Betty!). I went into the appointment feeling a little bit nervous. I wasn’t quite sure what he would find. He is regarded as one of the best specialists in the city, though, so I knew he was just the man for the job. I was hoping for a more definite diagnosis. Up until this point I was getting conflicting ideas of what it might be or what it could be that was causing the bleeding. Our ultrasound at the specialist’s office was really cool. We got to watch everything on a giant flat screen TV. it was definitely the most detailed ultrasound I have ever had. As soon as the screen turned on, the tech pointed out the discolored area on my uterus. It was clear as day. She said it was obviously a small bleed. Then she inspected and measured every single nook and cranny of the baby. It’s amazing that they can do that! She took measurements of the head, the torso, the body length, the stomach, etc. As she was inspecting the legs, I asked her if there was anything in between them. She looked between the legs from various different angles and zoomed in several times. There was ABSOLUTELY nothing there. She confirmed that we are having a baby girl! I was a little skeptical of such an early gender determination. She told me that a boy would definitely have SOMETHING growing between his legs by now. I said, “Maybe he’s just a late bloomer.” She looked at me with a crazy look on her face and told me to think about what I was saying. We all laughed. 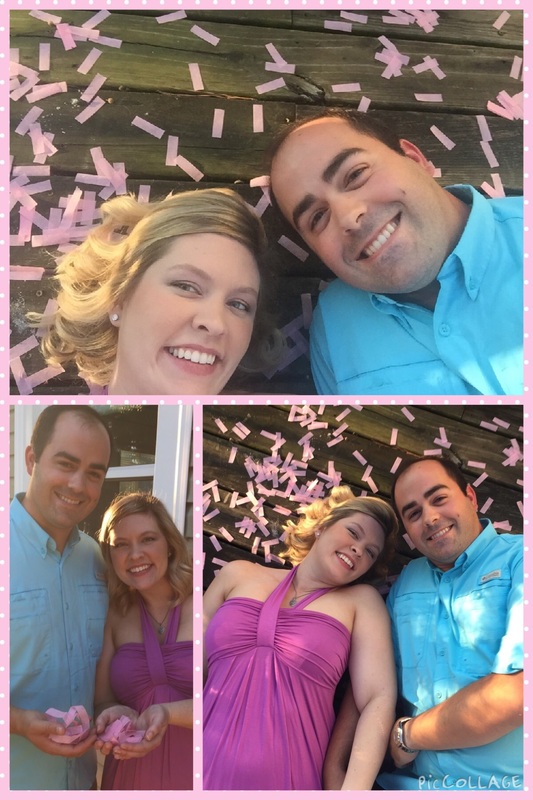 Matt and I were thrilled to learn that we are having a baby girl. Neither of us had a preference regarding the gender. We just wanted a healthy baby. After the tech left the room, the doctor came in. He told me that it was clearly a small separation in the placenta causing the bleeding. He drew pictures for us and explained everything in great detail. 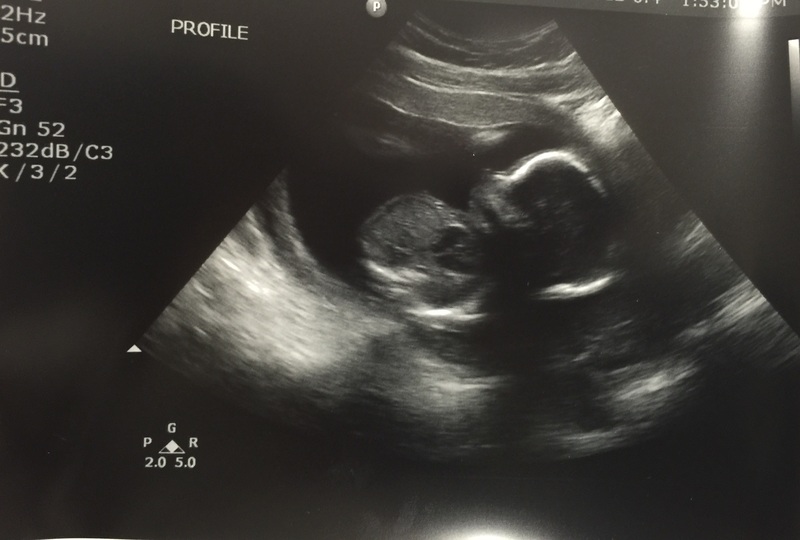 He told me that he felt very confident that this would be completely resolved by my next ultrasound in 4 weeks. He said that in his entire time practicing, he has only seen one case like mine that became so bad that the mother lost the baby. However, he sees cases like mine DAILY that completely resolve without any intervention. That was music to my ears! He took me off of bed rest because he doesn’t want me to develop blood clots in my legs. He said strict bed rest does not make any difference in the outcome of these types of scenarios. He just wants me to modify my activity level. For example, I can’t lift anything heavy or doing anything strenuous. The best news of all was that he looked at all of the measurements and pictures of the baby and said that the baby looks “great” and all of her structures look “perfect.” What a relief! The MFM specialist decided to keep me as his patient for the remainder of the pregnancy and deliver the baby himself. He will continue to monitor me to make sure the tear heals and I don’t have any further complications. He is going to re-check me in 4 weeks but wants me to come in immediately if I experience any more heavy bleeding. This week has been wonderful. One of the best doctors in the city told me how healthy my baby is, I got off of bed rest, I am receiving excellent care, I haven’t bled in 4 days and to top it all off we found out the baby’s gender. Last night we had our parents and siblings over for a small gender reveal. We shot off a pink confetti cannon in our yard and everyone cheered. Things are pretty great around here. We can’t wait for Lucy Grace to join our family in February!! Hi friends. A lot has transpired since my last post. You may remember that I was spotting and cramping two weekends ago and everything checked out fine when I visited my doctor the following Monday. Things went well all week until Friday. On Friday I was at the store picking up birthday presents for a few family members and I could tell something was wrong. I went to the bathroom and discovered blood. It was only a few spots, so I wasn’t too terribly concerned. I called my doctor’s office, but, as we know, the doctor doesn’t work on Friday. This baby sure does like to cause excitement when no one is working! The nurse scheduled an appointment for Monday and told me to go to the hospital if it got worse. As soon as I got home and put my feet up the spotting stopped and Friday night came and went. Saturday morning I woke up to more blood. This time it wasn’t just spotting. Matt and I decided to go to the hospital just to be overly cautious. The doctor on call did a pelvic exam and found a little bit of blood on my cervix, but she didn’t think it was an alarming amount. She took out the handheld doppler and quickly located the baby’s heartbeat (what a relief!). It was 170. She took some blood and came back to report that the blood work looked great and she wasn’t very concerned. Her main concern was that I am rh- and Matt is O+. Because she didn’t know the extent of the bleeding, she decided to play it safe and give me a Rhogam injection. If you are rh- and your baby has a positive blood type, your body can start producing antibodies that will kill the baby. Since Matt is O+, there is a strong chance that the baby will have a positive blood type as well. We waited a few hours while the blood bank mixed up the Rhogam injection and then they sent us on our way. They told us to come back if the bleeding worsened. I took it easy Saturday night and did not see any more bleeding. Sunday was the scariest day of my life. When I woke up and got out of bed I looked down and noticed my pajama pants were soaked in blood and there was blood gushing down my legs. Talk about a heart stopping moment. I ran in the bathroom where Matt was showering and struggled to get words out. On the ride to the hospital, the tears streamed down my face and my mind raced. I had a pretty strong feeling that I was losing the baby and I just couldn’t bear the thought. How could I lose this little angel before I even got the chance to hold it in my arms? Why would God bring me this far just to end it all now? It just didn’t make sense. None of it made any sense. By the time I got to the hospital the bleeding had stopped completely. The doctor did a pelvic exam and couldn’t find any blood. What?! How could that be? This time everyone seemed a little more serious. They called out the ultrasound tech immediately and started an IV in my arm to draw lots of blood. 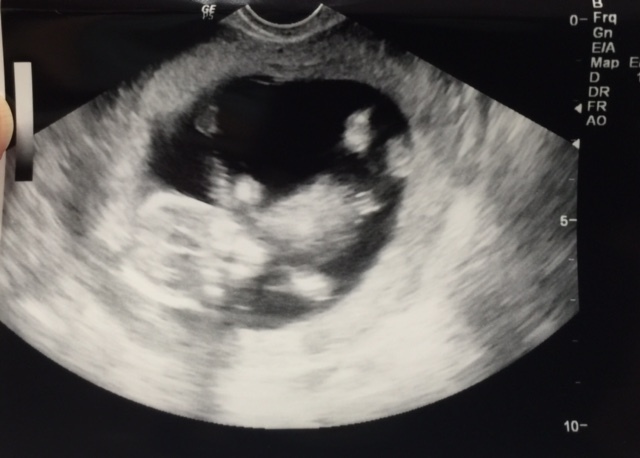 The ultrasound tech on call had to drive in from where she lived about 45 minutes away. Every moment seemed like an eternity. There’s nothing worse than sitting in your own blood and not knowing if your baby is alive or not. Sure enough, my little troublemaker was moving the top half of his or her arm from the elbow joint and appeared to be saying, “Hi Mom. Sorry for all the trouble.” All I could do was laugh. This was my first true mom moment where I couldn’t even be mad at the unnecessary ruckus because I was just so damn glad to see that everything was OK. I felt such a great sense of relief as I got wheeled back to my room to wait on the doctor. I thought everything had checked out perfectly until the doctor came back with a concerned look on his face. What the ultrasound tech failed to tell me was that she found blood behind the placenta. The doctor said he believed there was a tear in the placenta. He diagnosed me with a “threatened miscarriage.” He said that I might miscarry, but then again I might not. His guess was that I wouldn’t, but he really couldn’t be sure of that. I asked what they could do. Surely, I thought, there must be a solution to this problem. There must be a way to fix this or something I can take or do to hopefully prevent it. He informed that at 13 weeks pregnant there is absolutely nothing anyone can do to prevent a miscarriage. NOTHING. If it’s going to happen, it’s going to happen. That absolutely blew my mind. Coming from the world of infertility, I’m used to the doctor having solutions or at least suggestions for every problem that arises. If the uterine lining is too thin, progesterone will help. If you don’t ovulate, they can give you Femara. If you have hostile cervical mucus, they can circumvent the cervix all together with a procedure called IUI. If all else fails, they can do IVF. How is it possible that in an age where doctors can operate on a baby’s heart inside of the womb no one can fix one tear in a placenta?! I just couldn’t believe what I was hearing. The doctor said all I could do was go home and lay in bed and follow up with my doctor in the morning. He said I would know if I was miscarrying if I soaked through 3 pads in an hour. I left the hospital in tears and felt so desolate and confused. I’ve always heard that 12 weeks is the magic number. Lots of people don’t announce their pregnancy until 12 weeks when they feel they are in the “safe zone.” Everything is more stable at 12 weeks. My weekly app even went as far as to say that if you’ve reached 12 weeks and heard the heartbeat after 12 weeks, your chance of miscarriage is down to 1%. WAS I GOING TO BE THAT 1%? Was I going to make it to 13 weeks just to find out it had all been for nothing? My head was reeling. Would God really bring me this far just to leave me now? Was this my fault? When I went through infertility, I always struggled with this horrible feeling that my body was failing me. Every time my body was supposed to do something or produce something naturally, it didn’t or it couldn’t. Most of the time it continued to fail me even with medical intervention. It was the most frustrating feeling of my life, and I thought those days were finally behind me. But here I was 13 weeks pregnant and all of those feelings came rushing back. We had created this perfect little baby who had been unbelievably healthy and excelled at every turn. The first hcg levels were so high and healthy for this baby that the doctor initially thought it was twins. The hcg has continued to be one of the highest levels my doctor has seen. The baby has measured a week ahead at every ultrasound. Every time they look at the baby in depth everything looks perfectly beautiful so far. This baby is doing everything right to thrive and survive. I have fallen so unbelievably in love with this adorable little angel by watching all of his or her antics every week on ultrasound. I didn’t even know it was possible to feel a love so strong so soon before I could even feel the baby kick. And I felt like my body was failing me once again, but this time my body was failing this perfect little baby. There’s such a sense of guilt associated with that when you don’t know if you will be able to hold onto your child. Not because there is something wrong with the baby, but because your body simply isn’t giving that child what it needs. All of these thoughts were swirling around in my head all afternoon and then I had a pep talk with myself. I realized that I needed to start thinking positively for this child. Adding stress to the mixture wasn’t going to help anyone but that sure was easier said than done. I settled down and watched some TV and finally fell asleep. All hell broke loose when I woke up in the middle of the night in another pool of blood. How could this be happening? Why did I go to sleep? Now I had to see if I soaked through 3 pads in the next hour. That was the only way to know if I miscarried the baby or not. What a horrible freaking feeling. All you can do is count pads to know if the life inside of you is still thriving or not. If you read my earlier posts during all of the dreaded two week waits to find out if I was pregnant, you’ll know that I thought those were the longest and most torturous waits anyone could endure. I retract that statement. Waiting to see if you soak through 3 pads or waiting to see if the bleeding stops to know if your child is alive is the WORST wait of your life. I couldn’t go back to the sleep the rest of the night. I had the worst anxiety of my life. What if I feel back asleep and woke up covered in blood with no baby? I had to stay awake. Matt is out of town this week, so I came home with my mom when I was released from the hospital. I ran into her room last night in hysterics. I needed to be with someone. I had never felt so terrified in all my life. All I wanted to do was protect my child and make sure it was safe, but I couldn’t do anything. All I could do was lay there like a dummy and wait to see how many pads I soaked through. It was the most helpless and panic-inducing situation I have ever encountered. I laid next to my mom and my dogs with my eyes wide open for the rest of the night and prayed. When morning came I couldn’t wait to get to my doctor. Luckily, he painted a much better picture than the emergency room physician. After 2 ultrasounds, he determined that the area in question did not look like a tear or bleed in the placenta. He believed that it was actually a uterine contraction the tech at the hospital had seen. Since the uterus is a muscle, small contractions are completely normal at any time. While he could not assure me with 100% certainty that it was not a bleed or a tear, he was strongly convinced that it wasn’t. He said the baby and the placenta looked great. The tech showed me my sweet little angel bee bopping around in the womb and told me that this baby was “clearly not bothered” by anything that was going on. We listened to the heartbeat on the ultrasound and the doctor remarked that it “sounds like a girl but don’t paint the room pink just yet.” I told him that I figured only a girl could bring this much drama with her. Either that or she is determined to have her picture taken every week until she makes her debut. We had a good laugh about that. All of that was great news. The only problem is that I am still bleeding and we do not have a cause or a source of the bleeding. The doctor informed me that while it isn’t common, he has seen many patients throughout the years who just happen to bleed on and off throughout pregnancy for unexplained reasons. He said that some pregnant patients even come in at the same time every month with a full blown 5 day period. Talk about a mental breakdown! He assured me that nearly all of these patients go on to deliver healthy babies and even told me about a recent patient in a similar situation who had just delivered a beautiful 8.5 pound baby. He put me on strict bed rest (I can only get up to potty) and told me that he feels confident that with proper rest this issue will resolve itself. While he couldn’t completely rule out a miscarriage, he highly doubts that will happen in this case. He believes this baby will have a healthy delivery and go on to worry me every day for the rest of my life. I wouldn’t have it any other way. For now, you can find me laying flat for the foreseeable future. I have a follow up appointment a week from today. Let’s hope we don’t have any heart stopping moments between now and then. Prayers for a healthy, full-term pregnancy and a healthy baby are incredibly appreciated. If there’s one thing I’ve learned throughout all of this it’s that God will always carry us through. Even when we are at our absolute lowest, He is hard at work in the background. I know, without a doubt, that this is someone special growing inside of me and God has bigger plans for us. Baby P, who is clearly not bothered by any of this.